Sample Magic has earned a strong reputation as being one of the world’s leading provider of professional sound samples, instrument presets, musical components, music production resources, and software to producers across a wide range of genres. The latest addition to their award-winning products takes on dynamic processing with a powerful mix finalizing plugin called Boost. Boost extends the line of professional audio tools by Sample Magic. At its core, Boost is a simple mix enhancing utility designed to get your music sounding as full and loud as possible with only a minimal amount of processing. Using multiband compression, four-band equalization, stereo enhancement, brickwall limiting, and filters, Boost provides the essentials to give your sounds or an entire mix that final polish. 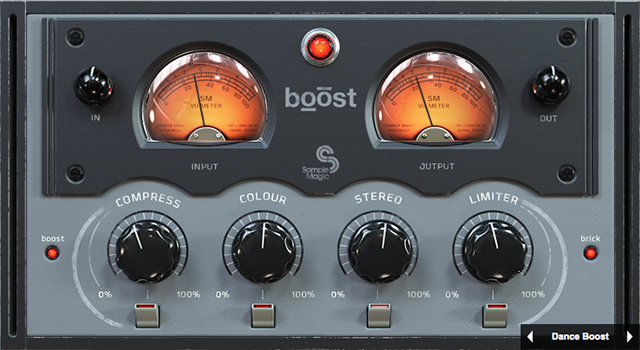 Boost is essentially a streamlined channel strip with four integrated processors that deliver some serious dynamic control. Place Boost on individual tracks, group channels, or on the mix buss to give your sounds or an entire mix some desired final treatment. Boost excels at enhancing harmonics, controlling dynamics, injecting musical coloration, creating width, achieving clarity, and boosting loudness to commercial levels. 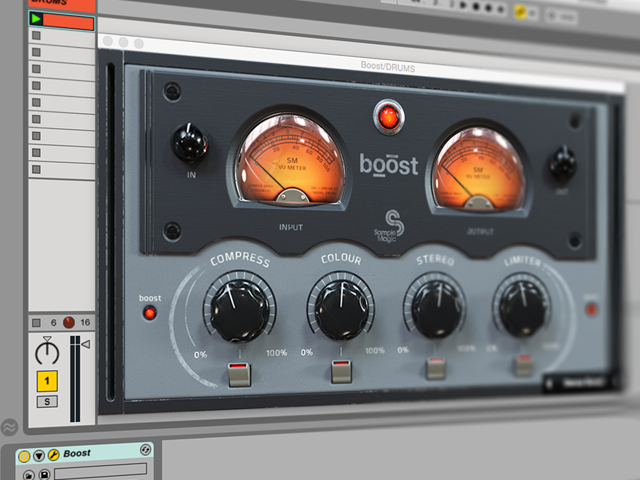 Boost is ideal for adding power, punch, and energy to drums, basslines, pads, leads, arpeggios, vocals, and final mixes. Boost can also be used to spring life into dull, muddy or weak sounds, fix live performances, DJ mixes, bad recordings, and even voiceovers. Boost sports a vintage hardware style looking interface that features two meters displaying input and output levels, two level controls, three function buttons, a bank of 64 presets, four enable switches, and four processing controls for dialing in the effects. The Compression knob controls the amount of multiband compression that is applied to the incoming signal. It also macro controls several other parameters simultaneously. Each of the included presets provide a slightly different style of compression with varying amounts of makeup gain, attack, decay times, and crossover frequencies. The Colour knob adjusts the spectral balance of the audio through a dynamically interactive equalizer circuit. Each of the included presets provide a slightly different ‘style’ of coloration that will be applied to the incoming signal. The defining characteristic of this macro is to boost bass frequencies around 50-100Hz while inversely cutting midrange around 2kHz – 4kHz, and adding subtle high-frequency gain around 9kHz – 14kHz. The Stereo knob adjusts the amount of stereo widening applied to the incoming signal. This control will widen the elements of the sound which are panned between the two L/R channels while leaving mono signals unaffected. Each of the included presets provide a slightly different amount of stereo widening. The Limiter knob is a powerful compression and peak limiting processor capable of transparently ‘shaving off ’ a few dB so you can slam a mix for maximum impact while still maintaining clarity. Each of the included presets provide a slightly different style of limiting. The Brick button enables a safety Brickwall limiter on the output signal. This limiter is placed after the Output gain and can be used either as a means of catching stray peaks or provide a third stage of compression. The Boost button provides an alternate routing matrix that places the EQ ahead of the limiter. When in ‘Boost’ mode, louder perceived volumes are possible by boosting EQ frequencies after the limiter. This red light found in the center of Boost allows you to enable and disable all processing of the plugin for quick reference. These controls enable and disable the corresponding processors. Each of the four macro controls have their own dedicated enable switch. The Input knob has a gain range of +/-12dB and is used for increasing or decreasing the amount of level before processing is applied. The Output knob has a gain range of +/-12dB and is used for increasing or decreasing the output level before the Brickwall Limiter. When Brick is enabled, the output level will never exceed 0dB. Boost comes loaded with 64 presets that are arranged in eight categories that define the type and amount of processing being applied. Light add slight color, stereo image improvements, and mild compression/limiting. Medium works well on unfinished mixes or works lacking in clarity with low levels of volume. Heavy offers significant dynamic range limiting, EQ, and stereo enhancement. Extreme is intended for recordings where little or no mix buss processing has already been added. Tracking offers zero latency and can be used to add color and warmth to a variety of instrument sounds. Instruments adds warmth to a variety of sounds. Dance and Rock offers a selection of preset settings favored by the Sample Magic team that can be used on a variety of recordings. signal through a complex chain of professional effects. Easily bypass individual processing sections for quick comparison between processed and unprocessed sounds. between processed and unprocessed sounds. Low CPU usage and latency. ‘Boost’ mode to re-order components for additional loudness! ‘Brick’ switch to ensure zero digital clipping. Boost provides a quick and easy way to step up your sounds and mixes. It offers four essential processors in one plugin which lightens the CPU load and allows you to make mix decisions without opening several plugins at once. The simple design and macro control concept helps to increase workflow and makes it easier to make mix decisions without feeling overwhelmed by complex plugin controls and options. This is a great plugin when you’re looking for fast and effective results! Boost is available to download at Sample Magic. Sample Magic is the world’s leading provider of musical components and sound samples to producers across a wide range of genres. For over ten years they have specialized in the finest cutting-edge audio, plugins, apps and courses, building a reputation for unique, award-winning products.